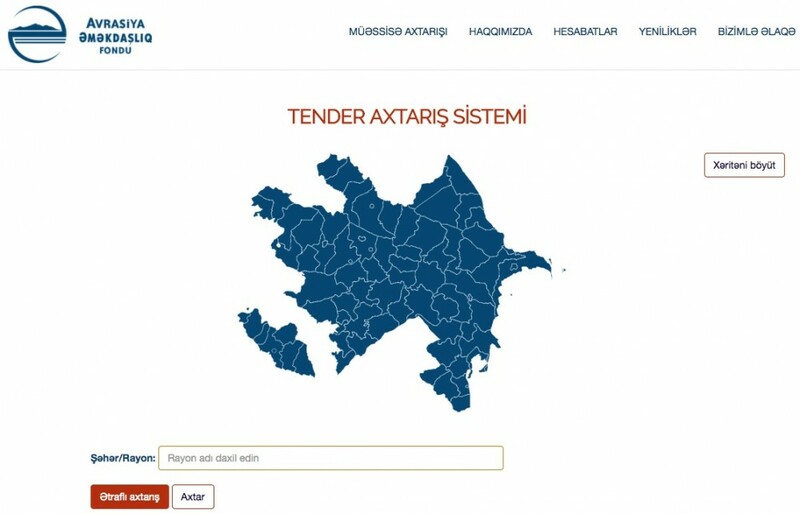 A group of experts at TI’s Azerbaijan Chapter have recently launched a website that gives the public easy access to procurement data published by the government of Azerbaijan. What is novel about www.tenderinfo.az is that it provides a single-access point to procurement data currently scattered across Excel/PDF files annually released by the government. The interactive map of Azerbaijan and a detailed search function helps the users easily navigate through the website and find the information of interest to them without having to go through myriads of irrelevant details (Fig.1). The home page features an interactive regional map of Azerbaijan, which the user may click onto to find out the full list of procurements awarded in a particular region (city or rayon, an administrative unit of Azerbaijan). Alternatively, the user may refer to a detailed search function right below the map to conduct a more extensive search. The detailed search engine allows the user to search all data from 2010 through 2017 using a number of indicators. The search can be done across regions, years, value range, procuring entities and successful bidders. The following screenshot of the website provides an example of a search using some of the benchmarks mentioned above (Fig.2). 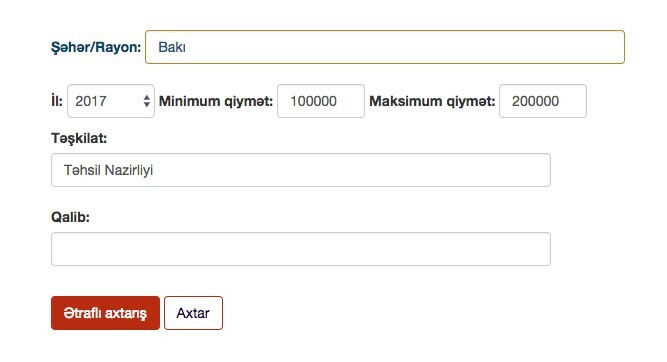 Here the user is looking for procurement awards made by Baku’s Executive Authority and worth 10,000 to 200,000 Manats. 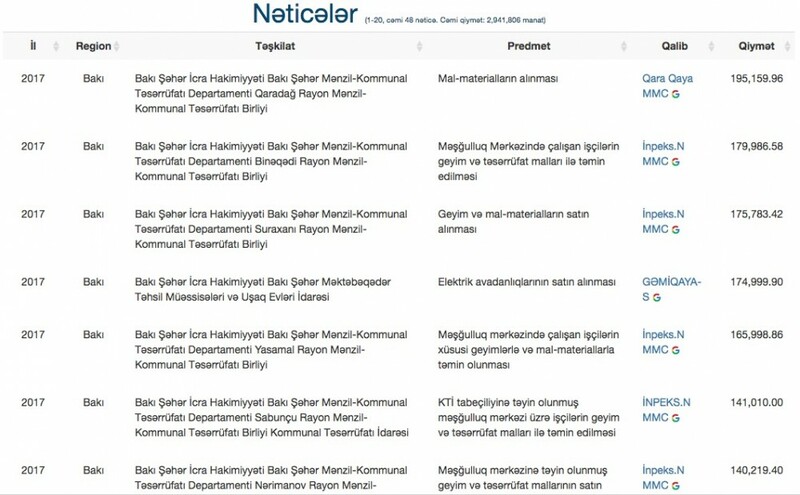 The next screenshot lays out the search results: here procurements awarded by Baku’s Executive Authority are listed in descending order of their value (Fig.3). 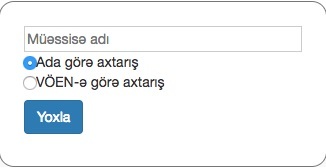 The user may arrange the search results alphabetically (e.g. the names of procuring entities, bidders, etc.) and chronologically (e.g. years), or they may sort the value of procurements in an ascending/descending order. Users also have direct access from the website to the database of commercial entities’ registry run by tax authorities. Once they enter the name of the company into a separate window available on the website (“Search of enterprise”) and click “Verify” button, they are referred to the database, in which they may find more information about the company in question (Fig.5). There are plans to enhance the utility of the website to the businesses by publishing tender notices in an interactive format in the future. The website is currently in Azeri only.